The Rotary Club of Cleveland, in conjunction with Corporate Member Howe Ford Boxer, brings you another in our series of Business and Market Breakfasts. On the outskirts of Lae in Papua New Guinea is a small Catholic School and Health Clinic. The Mary Queen of Peace Community is under development to serve the needs of the people in Malahang and the surrounding areas. Last week the Rotary Club of Cleveland was visited by Sister Cathy from the Mary Queen of Peace Community. This is another step in the emerging relationship between the Club and the Community. Members of the Club learned about the challenges that Sister Cathy and the other religious and lay workers in the Mary Queen of Peace Community face in bringing education and community health services to the Malahang community. Challenges that we hardly dare to contemplate. The Club has decided to support the development of the Mary Queen of Peace Community as an ongoing International Service Project. Through Donations in Kind (DIK) and Rotary Australia World Community Service (RAWCS) there are opportunities to provide desks, chairs, library shelving and books to fit out the school, and basic hospital equipment for the community health facility. There are opportunities to financially support the education of children - education in PNG is not free. Over time there will be opportunities to visit the community and see first hand the work being undertaken. 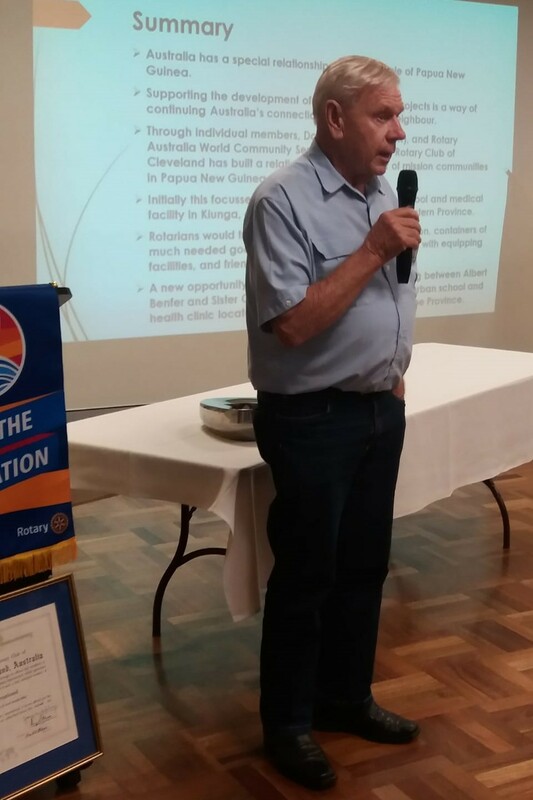 PP Albert Benfer has been a long time supporter of Rotary working in PNG. Our closest neighbour has a special place in the lives of many Australians. This week we celebrated the work that ShelterBox Australia makes toward relieving suffering and building hope in the face of natural disasters and conflict. ShelterBox is a Rotary International endorsed program that operates with the support of Rotary Clubs and indivual Rotarians who contribute financially and as members of the teams who distribute the shelterboxes. Have you thought about the opportunity to help others through organ and tissue donation? Well we were all challenged to do just that by Alana Cresswell and David Clune of DonateLife. This is the public face of the Australian Government Organ and Tissue Authority. Organ and tissue transplantation is no longer experimental - our Australian surgeons are increadibly skilled. Age is not necessarily a barrier to organ and tissue donations up to the age of 90 years, though it is a factor in the assessment of the viability of potential organs and tissues. Is our community dementia friendly? Tonight we were joined by Michelle Schlitter and Ann Donaghy from Centacare and learnt what it is like to be a dementia friendly community. As our population ages we all find ourselves confronted in some way with issues that make our lives or those of others less comfortable. Dementia is the term used to describe the symptoms of a group of illnesses which impact on a person's functioning - memory, intellect, rationality, social skills and physical function. These illnesses can happen to anyone but they are more common after the age of 65. Capture the Moment at the 2019 Rotary Convention in Hamburg. Register by 15 December to save. Around the world, 400 million people can’t afford or don’t have access to basic health care, which can result in pain, poverty, and misery. That’s why Rotary members are devoted to fighting and preventing diseases. From offering temporary clinics, blood donation centers, and training facilities in underserved communities to designing and building infrastructure to allow doctors, patients, and governments to work together, Rotary members take on efforts both large and small. The campaign to end the scourge of poliomyelitis continues - join Rotary in helping to eradicate this disease. Watch this short video to see what your contribution to Rotary achieves. In a world where intolerance and violence fueled by religious differences are seemingly increasing, one Rotary club in Indonesia is showing how diversity can help prevent a pandemic threat. The generosity of Rotarians and others enables Rotary to keep Doing Good in the World. Last year, Rotarians completed over 30,000 Rotary service projects and dedicated 24.3 million hours to volunteering in the communities that need our help the most. What does it mean to practice peace? Nations observe 21 September as International Day of Peace, a “day of global ceasefire and nonviolence.” Rotary’s commitment to building peace and resolving conflict is rooted in the Rotary Peace Centers, which yearly prepare up to 100 fellows to work for peace through a two-year master’s degree program or a three-month certificate program at partner universities worldwide. Mark Huddleston is a Rotarian mover and shaker who is keenly interested in shaping the future of the member clubs of Rotary International. A leader who puts into practice what he proposes, this little book is a valuable read for all, but especially those who are leaders and aspiring leaders of Rotary Clubs. Dîner en Rouge is the annual fundraiser that supports services for Redlanders affected by domestic and family violence. The Rotary Club of Cleveland is proud to be working with Redland City Council, Zonta clubs, Soroptimist International, Redland Foundation and local domestic and family violence service advocates on this year’s Dîner en Rouge. and aim to finish at 8:00pm. Join us tonight to hear the story of "Sarz Sanctuary". Sara Zelenak, aged 21, was killed in the London Bridge and Borough Street Market terror attack. For Julie and Mark Wallace, Sara's parents, it is hard to put into words how unbelievably traumatic, shocking, painful and unfair it has been losing their daughter. Each year the Rotary Club of Cleveland provides a series of scholarships that support high school students to achieve their goals in education. Tonight we will be hearing from two of the scholarship holders about how the funds the Club provided made a difference in their lives. Come along and hear how your efforts have made a difference. There is a joint Board meeting after this evening's Club meeting. This is the first of two joint meetings that enable the incoming Club Board to become familiar with the business of the Club. Cleveland Film Company is a contributor to the social and cultural fabric of Southeast Queensland. Bradford Walton is a writer-director who trained in the United Kingdom in TVC and music video production. For the past 20 years Brad has produced national TVC campaigns, documentaries, short films and feature film screen plays. Join us to hear Brad's story and his plans for the future, and the involvement of students and local businesses. Visitors are always welcome in our Club - bring a business acquaintance or friend who may be interested in the work that Rotary does in our community.